Hook up a SlingBox Solo or Pro to your home network and TV equipment, and it takes your TV signal, encodes it, and streams it over the internet. 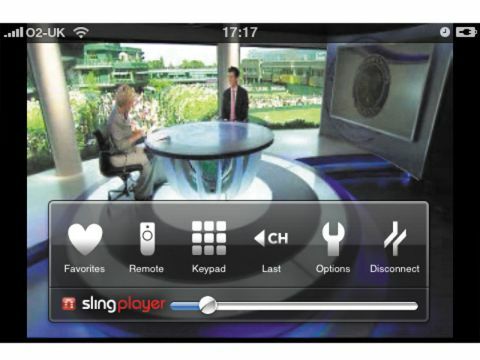 Install SlingPlayer Mobile on your iPhone or iPod touch to do the same. SlingBoxes integrate with almost any hardware – Sky+, Apple TV, cables boxes – and can control them remotely. But the setup is expensive – £112 for a SlingBox Solo, plus this app and internet access – and you can only receive broadcasts over WiFi. The quality is good and solid, but the interface is sparse to the point of confusing – you swipe to see more options – and channel-changing is sluggish.